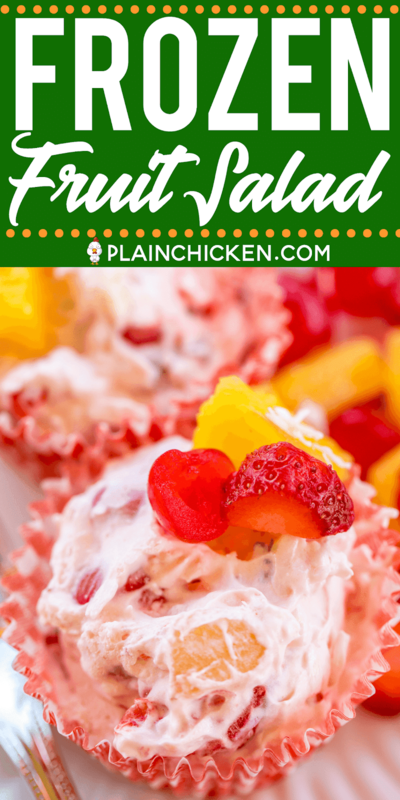 This Frozen Fruit Salad was a special request from Chicken Legs. One of his favorite lunch spots recently closed. He would eat there when he visited his parents. It was a "salad" place. He would get a scoop of chicken salad, egg salad, and frozen fruit salad for dessert. Since we already have great recipes for chicken salad and egg salad, he asked me to make a frozen fruit salad for him. 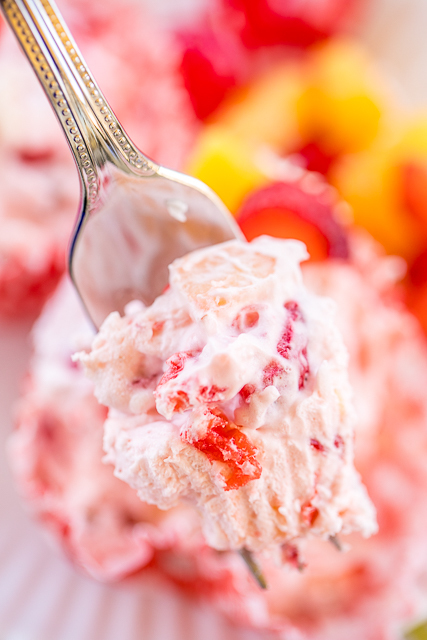 After some research and tweaking, we came up with this delicious Frozen Fruit Salad recipe. 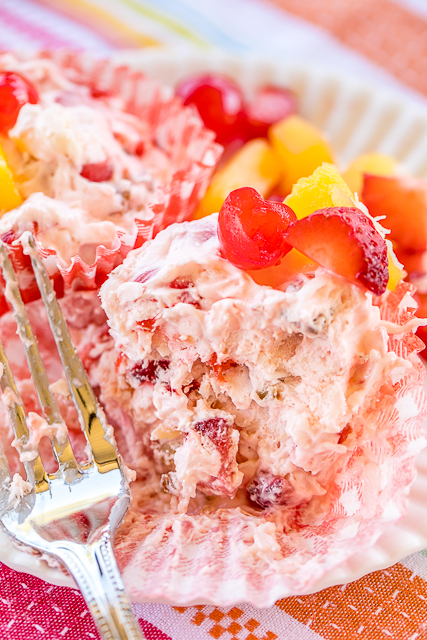 Cream cheese, cool whip, cherries, pineapple, strawberries, coconut and pecans. Just mix up the salad, scoop it into cupcake liners and pop in the freezer. SO easy! 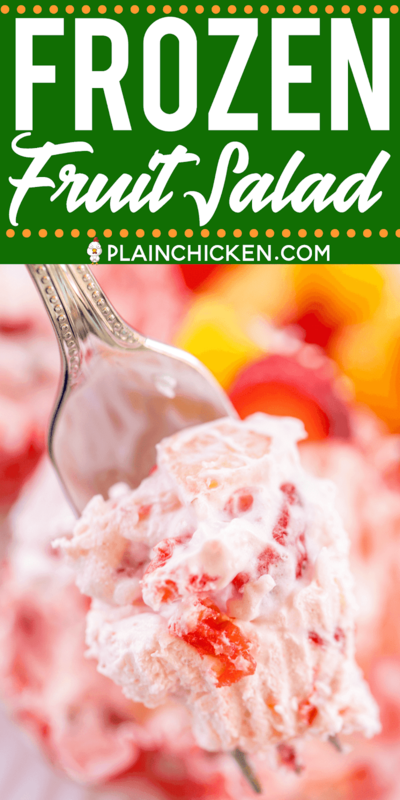 You can make this Frozen Fruit Salad ahead of time and keep frozen until ready to serve. You want to pull this out of the freezer at least 10 minutes before serving. This would be great for all your summer cookouts! It is a great way to beat the heat!! In a large bowl, beat the cream cheese and sugar until fluffy. 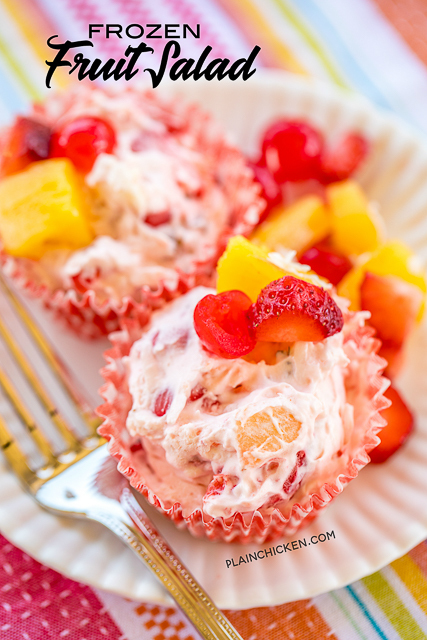 Add the chopped cherries, pineapple, strawberries, pecans and coconut to cream cheese mixture. Stir to combine. Fold in whipped topping. Line muffin cups with paper or foil liners. 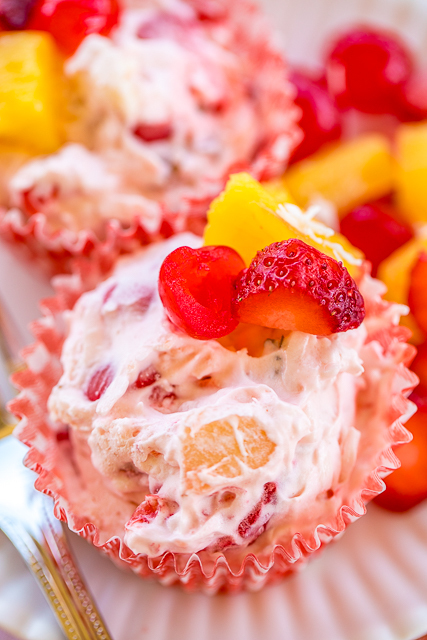 Spoon fruit salad mixture into cups. Freeze until firm. Remove from the freezer 10 minutes before serving. This sounds great for the 4th of July! When you say that you experimented, did you try other fruits and they did not work out as well? Which did you try or would you say would not work out? The 4th is berry season around here, so I was thinking of raspberries, strawberries and blueberries. But I do not want to end up with mush! :) Thank you for another great idea! This sounds great. Did you try other fruit? If so, which ones worked and which ones didn't. Will be making this for sure. My mother-in-law used to make this. I had the recipe once but have lost it. Glad to have it now. Thanks!! I have a similar recipe and can tell you that bananas and blueberries definitely work! So does a can of well drained fruit cocktail. 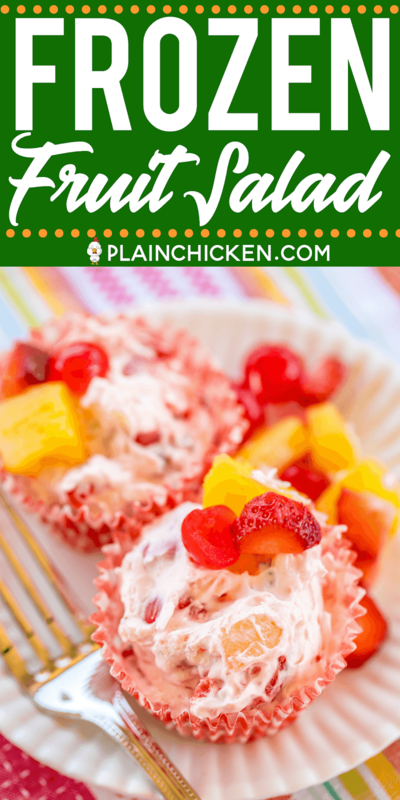 This is SUCH a great recipe and serving individual portions in cupcake liners is BRILLIANT! So much easier than trying to slice frozen fruit salad. Thanks for sharing. love love love this dessert! Made it for my family and all my sisters asked for the recipe! 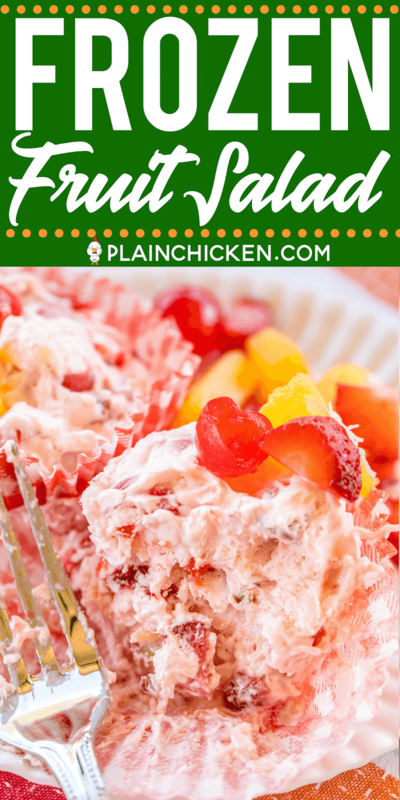 It is easy and delicious and best of all you can make it ahead of time because you keep it in the freezer!! Just a note....both my brother in laws liked it better eaten straight out of the freezer with their fingers. Not thawed and eaten with a fork! It was a fun dessert! Thanks Steph!